Fall is a fantastic time for a trip to the Smoky Mountains region. The mountain air has a snap in it, and if you’re lucky, you can still catch some of the fall foliage at the lower elevations. If you’re thinking of using one of the long weekends this month to escape for a short vacation, your time would be well spent here in the Smokies. You think there’s no such thing, but if you choose to stay at Saddle Ridge, one of the most beautiful cabins in the Smoky Mountains, you’ll see that there is, indeed, such a thing as the perfect lodging option. Offered for rent through Great Cabins in the Smokies, Saddle Ridge is a 1 BR, 2 BA log cabin located on a quiet private road. No neighbors or traffic noise here to interrupt your peaceful solitude. A large, open living space with high ceilings and exposed rafters instantly provides a bit of rustic charm; you’ll notice it the moment you open the door. This Wears Valley cabin is a perfect choice for honeymooning couples, or anyone hoping to get away from all of life’s everyday challenges. When you stay at Saddle Ridge, you won’t miss out on the comforts and conveniences of home. This Wears Valley cabin has everything you need for a comfortable vacation: fully equipped kitchen, comfortable furniture, a king-sized bed, and satellite TV with DVD and VCR players. But you’ll notice it also has some extras like a large stone fireplace in the corner of the living room. Bring in some logs and get a fire going for a little added warmth. The king-sized bed ensures a good night’s rest, and the pool table gives you another entertainment option for times when you’re not out exploring the many attractions in the area. There’s also a private outdoor hot tub. Slip into it and let the warmth relax your tired muscles after a day of hiking in Great Smoky Mountains National Park. In the mornings, enjoy your coffee out on the porch. 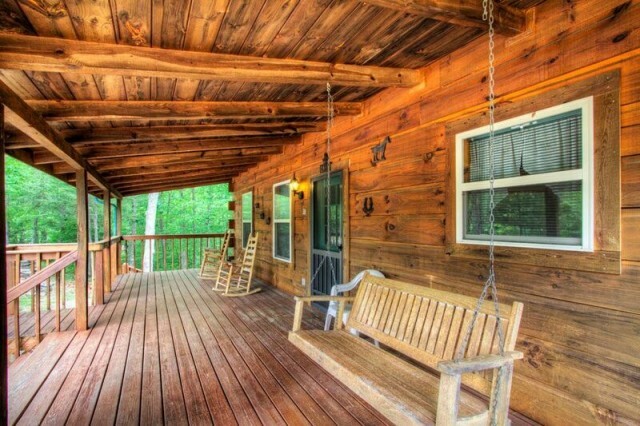 Sit in the rockers or the porch swing as you enjoy the beautiful wooded setting. This cabin has great mountain views, too. It’s the best of both worlds! Great Cabins in the Smokies offers many cabins in the Smoky Mountains for rent, and Saddle Ridge is definitely at the top of the list as one of the best cabins in the area. Call today to make reservations, or go online to look at other Wears Valley cabin options for your fall vacation today. You don’t want to miss out on a perfect vacation!